A black and white photograph of the demolition of the Heydenshore Park cottages. Heydenshore Park was established as a private resort of cottages in 1900 by the Whitby Street Railway and Park Company. The last owner of the park was Clive Hatch, son of the founder Fred Hatch, who died in 1963. 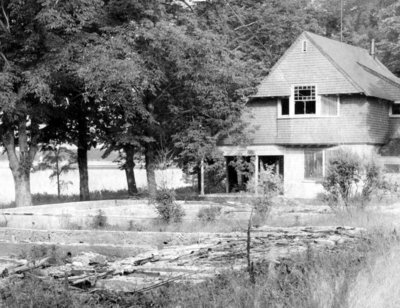 In 1965 the Whitby Public Utilities Commission purchased the park from the estate of Clive Hatch and demolished all but one of the cottages. Demolition of Heydenshore Park Cottages, July 1965, The Oshawa Times. Whitby Archives 12-001-047.